These are not your ordinary chips. Not so keen on potatoes, but the kids want chips? (Potatoes are my least favourite veg – they just don’t hold their own in the veg family when you look at their nutritional value, or relative lack thereof.) Can’t get the kids to eat polenta? 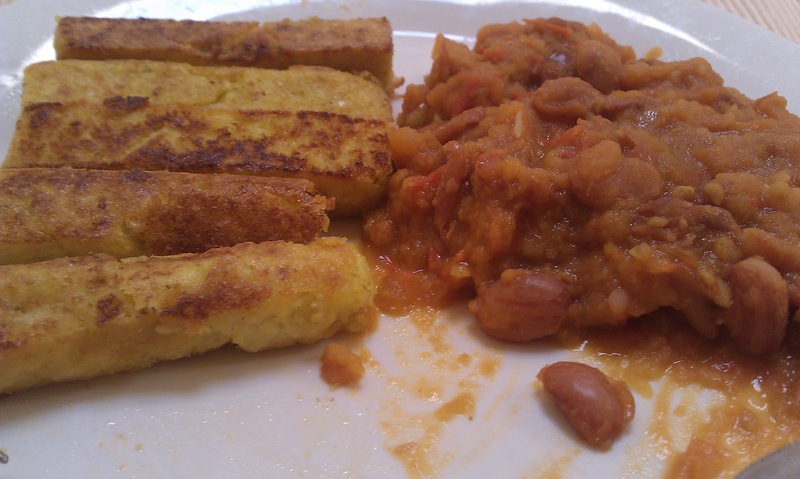 Problems solved – polenta chips! 1) Put garlic and basil in TM bowl. Chop for 10 seconds on speed 7. 2) Add oil (2 tablespoons) and cook for 4 minutes, 100 degrees, speed 1. 3) Add water and stock paste and cook for 10 minutes, 100 degrees, speed 1. 4) Immediately add polenta and cook for 15 minutes, 100 degrees speed 2. 5) Add cheese to TM bowl and mix on speed 5 until smooth and well distributed (about 20-30 seconds). 6) Once polenta is cooked, pour into a rectangular baking tin (about 30cm x 20cm; you want the polenta to be 2cm thick maximum). 7) Place in the fridge for an hour or so to cool completely. Once cool, turn out onto a large bread board. Cut in half lengthways, then into chip-sized sticks. 8) Heat 2 more tablespoons of oil over medium-high heat in a large frying pan. Test if oil is hot enough by placing one polenta chip in and seeing if it sizzles immediately – if not, take the polenta stick out and wait just a touch longer. You want the oil sizzlingly hot so it seals the polenta rather than soaking in to the polenta. 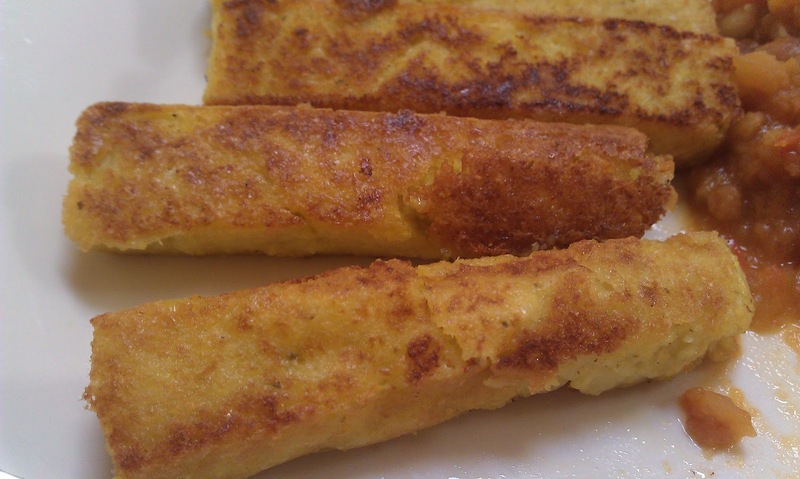 Once oil is hot enough, lay polenta sticks in the pan being careful not to overcrowd. Cook for about 2 minutes each side, or until golden brown and crispy. Set on paper towels while you fry the rest. 10) Serve with just about anything, and enjoy! This makes enough to serve 4 as part of a main meal (such as with baked beans, see recipe below), or serves about 6 as a side for, say, a roast dinner. We had these tonight with baked beans. I typically do bake my beans, even though I cook them in the thermomix initially. I’m a traditionalist, and I do believe that the longer cooking time in the oven does help to develop the flavours. That being said, sometimes you just can’t get organised in time. So I altered my regular baked beans recipe to be done quickly in the TM without baking in the oven. They were pretty good; almost as good as true baked beans. 1) Put onion and garlic in TM bowl. Chop on speed 7 for 10-15 seconds. 2) Add oil. Cook for 3 minutes on 100 degrees, speed 1. 3) Add tomatoes, beans, sugar and veg stock. Cook for 20 minutes, Varoma, reverse, speed soft. I’ve had this post saved. Love the sound of it all. Woohoo! It was delicious. We had the 2nd half of the chippies for lunch the next day. They’re great, as you can just fry what you will eat and keep the rest of the polenta sticks in the fridge ready to fry up when you get peckish!